Ook bij een behandeling van panitumumab bij darmkanker met een karakter van (K)-RAS wild type blijkt de plaats van de primaire tumor, rechts of links, van groot belang. De respons en overall overleving vertoonde grote verschillen tussen linkszijdige tumoren of rechtszijdige tumoren. (zie ook dit studierapport waarin vergelijkbare resultaten werden gezien bij cetixumab en bevacizumab (Avastin), ook twee zogeheten anti EGFR-medicijnen voor RAS wild type darmkanker. 435 van de 559 (78%) darmkankerpatiënten (met K-RAS wild type) die meededen aan twee verschillende studies (PRIME en PEAK) had de primaire tumor aan de linkerkant. Hiervan bereikte een groter aantal patiënten behandeld met panitumumab versus een groep met de tumor aan de rechterkant veel betere resultaten d.m.v. een tumorvermindering (ETS) (PRIME: 62% vs. 36%; PEAK: 58% versus 41%); de mediane grootte van de tumorvermindering (DpR) was ook beter met panitumumab (PRIME: 59% versus 49%; PEAK: 70% versus 48%). In gepoolde analyses van de beide studies bereikten meer patiënten met rechtszijdige ziekte een vermindering van tumoromvang en aantal tumoren (ETS) indien behandeld met panitumumab dan met een vergelijkbaar medicijn (39% versus 29%). Behandeling met panitumumab voorspelde een mediaan langere overall overleving op de lange termijn bij beide groepen. Om het belang van deze studie duidelijk te maken hier een gedeelte uit de introductie van het volledige studierapport: Relationships between tumour response and primary tumour location, and predictors of long-term survival, in patients with RAS wild-type metastatic colorectal cancer receiving first-line panitumumab therapy: retrospective analyses of the PRIME and PEAK clinical trials dat gratis is in te zien. Vrij vertaald met hulp van google translate en klik ook vooral op de referentienummers achter bepaalde zinnen. Referentielijst staat zowel onderaan artikel als in het volledi8ge studierapport. Systemische behandelingen voor uitgezaaide darmkanker (mCRC) omvatten conventionele op fluoropyrimidine gebaseerde chemobehandelingen en medicijnen die gericht zijn op blokkering van de bloedvaten (vasculaire angiogenese) of de zogeheteen epidermale groeifactorreceptor (EGFR).3,4 Voor deze laatste groep worden de anti-EGFR monoclonale antibodies panitumumab en cetuximab gegeven. In eerdere prospectieve analyses van twee gerandomiseerde gecontroleerde studies, PEAK en PRIME, bleek de tumorlocatie de uitkomsten te beïnvloeden na behandeling met het anti-EGFR monoklonaal antilichaam, panitumumab.14 In de fase II PEAK studie, patiënten met RAS WT en linkkszijdige primaire tumor, behandeld met panitumumab plus chemokuur van (m)FOLFOX6 had mediaan een langere progressiewvrije ziekte (PFS) en mediaan betere overall overleving (OS) dan patiënten behandeld met bevacizumab (Avastin) plus mFOLFOX6 (PFS: 14.6 vs. 11.5 maanden; OS: 43.4 vs. 32.0 maanden). In de grotere fase III PRIME-studie verhoogde panitumumab plus FOLFOX4 significant de mediane PFS en mediane OS versus FOLFOX4 alleen bij RAS WT-patiënten met linkszijdige tumoren. (PFS: 12.9 vs. 9.2 months; OS: 30.3 vs. 23.6 months). Relationships between tumour response and primary tumour location, and predictors of long-term survival, in patients with RAS wild-type metastatic colorectal cancer receiving first-line panitumumab therapy: retrospective analyses of the PRIME and PEAK clinical trials dat gratis is in te zien. First-line panitumumab was associated with improved ETS and DpR vs. comparator in patients with left-sided mCRC. ETS may identify a subgroup of patients with right-sided disease who might respond to panitumumab. Data from two trials of panitumumab in metastatic colorectal cancer (mCRC) were retrospectively analysed to investigate the effects of primary tumour location on early-tumour shrinkage (ETS) and depth of response (DpR), and identify factors predicting long-term survival. Patients with RAS wild-type mCRC from PRIME (NCT00364013) and PEAK (NCT00819780) were included. ETS was defined as a ≥30% reduction in the sum-of-the-longest-diameters of measurable target lesions at eight weeks. DpR was the maximum percentage change from baseline to nadir in patients with shrinkage. Univariate and multivariate logistic analyses of short- versus long-term survivor data were performed. A total of 435/559 (78%) patients had left-sided disease. Of these, a higher proportion of patients treated with panitumumab versus comparator achieved ETS (PRIME: 62% vs. 36%; PEAK: 58% vs. 41%); median DpR was also higher with panitumumab (PRIME: 59% vs. 49%; PEAK: 70% vs. 48%). In pooled analyses of the studies, more patients with right-sided disease achieved ETS if treated with panitumumab than comparator (39% vs. 29%). Panitumumab treatment consistently predicted long-term survival. Ferlay, J. et al. Cancer incidence and mortality worldwide: sources, methods and major patterns in GLOBOCAN 2012. Int J. Cancer 136, E359–E386 (2015). Van Cutsem, E., Cervantes, A., Nordlinger, B., Arnold, D. & Group, E. G. W. Metastatic colorectal cancer: ESMO Clinical Practice Guidelines for diagnosis, treatment and follow-up. Ann. Oncol. 25(Suppl 3), iii1–iii9 (2014). National Comprehensive Cancer Network. Clinical Practice Guidelines in Oncology: Colon Cancer Version 2.2018. https://www.nccn.org/professionals/physician_gls/default.aspx. Accessed May 2018. Van Cutsem, E. et al. ESMO consensus guidelines for the management of patients with metastatic colorectal cancer. Ann. Oncol. 27, 1386–1422 (2016). Douillard, J. Y. et al. Randomized, phase III trial of panitumumab with infusional fluorouracil, leucovorin, and oxaliplatin (FOLFOX4) versus FOLFOX4 alone as first-line treatment in patients with previously untreated metastatic colorectal cancer: the PRIME study. J. Clin. Oncol. 28, 4697–4705 (2010). Bokemeyer, C. et al. Efficacy according to biomarker status of cetuximab plus FOLFOX-4 as first-line treatment for metastatic colorectal cancer: the OPUS study. Ann. Oncol. 22, 1535–1546 (2011). Clarke, C. N. & Kopetz, E. S. BRAF mutant colorectal cancer as a distinct subset of colorectal cancer: clinical characteristics, clinical behavior, and response to targeted therapies. J. Gastrointest. Oncol. 6, 660–667 (2015). Pietrantonio, F. et al. Predictive role of BRAF mutations in patients with advanced colorectal cancer receiving cetuximab and panitumumab: a meta-analysis. Eur. J. Cancer 51, 587–594 (2015). Rowland, A. et al. Meta-analysis of BRAF mutation as a predictive biomarker of benefit from anti-EGFR monoclonal antibody therapy for RAS wild-type metastatic colorectal cancer. Br. J. Cancer 112, 1888–1894 (2015). Jones, J. C. et al. Non-V600BRAF mutations define a clinically distinct molecular subtype of metastatic colorectal cancer. J. Clin. Oncol. 35, 2624–2630 (2017). Seligmann, J. F. et al. Association of tumor HER3 messenger RNA expression with panitumumab efficacy in advanced colorectal cancer. JAMA Oncol. 4, 564–568 (2018). Sartore-Bianchi, A., Marsoni, S. & Siena, S. Human epidermal growth factor receptor 2 as a molecular biomarker for metastatic colorectal cancer. JAMA Oncol. 4, 19–20 (2018). Scartozzi, M. et al. Analysis of HER-3, insulin growth factor-1, nuclear factor-kB and epidermal growth factor receptor gene copy number in the prediction of clinical outcome for K-RAS wild-type colorectal cancer patients receiving irinotecan-cetuximab. Ann. Oncol. 23, 1706–1712 (2012). Boeckx, N. et al. Primary tumor sidedness has an impact on prognosis and treatment outcome in metastatic colorectal cancer: results from two randomized first-line panitumumab studies. Ann. Oncol. 28, 1862–1868 (2017). Loupakis, F. et al. Primary tumor location as a prognostic factor in metastatic colorectal cancer. J. Natl. Cancer Inst. 107, dju427 (2015). Tejpar, S., Stintzing, S. & Ciardiello, F. Prognostic and predictive relevance of primary tumor location in patients with RAS wild-type metastatic colorectal cancer: Retrospective analyses of the CRYSTAL and FIRE-3 trials. JAMA Oncol. 3, 194–201 (2017). Petrelli, F., Tomasello, G. & Borgonovo, K. Prognostic survival associated with left-sided vs right-sided colon cancer: a systematic review and meta-analysis. JAMA Oncol. 3, 211–219 (2017). Stintzing, S., Tejpar, S., Gibbs, P., Thiebach, L. & Lenz, H. J. Understanding the role of primary tumour localisation in colorectal cancer treatment and outcomes. Eur. J. Cancer 84, 69–80 (2017). Boeckx, N. et al. The predictive value of primary tumor location in patients with metastatic colorectal cancer: a systematic review. Crit. Rev. Oncol. Hematol. 121, 1–10 (2018). Sartore-Bianchi, A. et al. Dual-targeted therapy with trastuzumab and lapatinib in treatment-refractory, KRAS codon 12/13 wild-type, HER2-positive metastatic colorectal cancer (HERACLES): a proof-of-concept, multicentre, open-label, phase 2 trial. Lancet Oncol. 17, 738–746 (2016). Guinney, J. et al. The consensus molecular subtypes of colorectal cancer. Nat. Med. 21, 1350–1356 (2015). Arnold, D. et al. Prognostic and predictive value of primary tumour side in patients with RAS wild-type metastatic colorectal cancer treated with chemotherapy and EGFR directed antibodies in six randomised trials. Ann. Oncol. 28, 1713–1729 (2017). Holch, J. W., Ricard, I., Stintzing, S., Modest, D. P. & Heinemann, V. The relevance of primary tumour location in patients with metastatic colorectal cancer: A meta-analysis of first-line clinical trials. Eur. J. Cancer 70, 87–98 (2017). Taieb, J. et al. 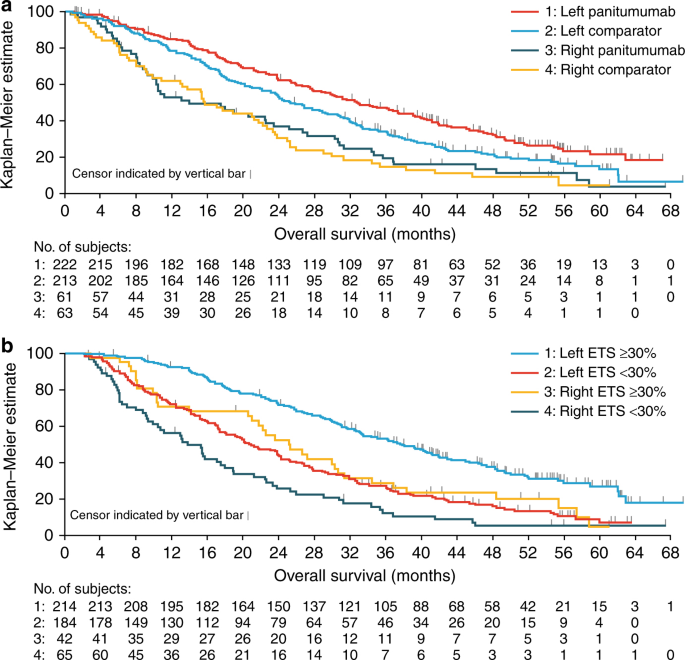 Exploratory analyses assessing the impact of early tumour shrinkage and depth of response on survival outcomes in patients with RAS wild-type metastatic colorectal cancer receiving treatment in 3 randomised panitumumab trials. J. Cancer Res Clin. Oncol. 144, 321–335 (2018). Piessevaux, H. et al. Use of early tumor shrinkage to predict long-term outcome in metastatic colorectal cancer treated with cetuximab. J. Clin. Oncol. 31, 3764–3775 (2013). Douillard, J. Y. et al. Impact of early tumour shrinkage and resection on outcomes in patients with wild-type RAS metastatic colorectal cancer. Eur. J. Cancer 51, 1231–1242 (2015). Heinemann, V. et al. Early tumour shrinkage (ETS) and depth of response (DpR) in the treatment of patients with metastatic colorectal cancer (mCRC). Eur J Cancer 32, 1927–1936 (2015). Douillard, J. Y. et al. Panitumumab-FOLFOX4 treatment and RAS mutations in colorectal cancer. N. Engl. J. Med. 369, 1023–1034 (2013). Schwartzberg, L. S. et al. PEAK: a randomized, multicenter phase II study of panitumumab plus modified fluorouracil, leucovorin, and oxaliplatin (mFOLFOX6) or bevacizumab plus mFOLFOX6 in patients with previously untreated, unresectable, wild-type KRAS exon 2 metastatic colorectal cancer. J. Clin. Oncol. 32, 2240–2247 (2014). Price, T. J. et al. Update on optimal treatment for metastatic colorectal cancer from the ACTG/AGITG expert meeting: ECCO 2015. Expert Rev. Anticancer Ther. 16, 557–571 (2016). Vogel, A., Hofheinz, R. D., Kubicka, S. & Arnold, D. Treatment decisions in metastatic colorectal cancer - beyond first and second line combination therapies. Cancer Treat. Rev. 59, 54–60 (2017). Kohne, C. H. et al. Clinical determinants of survival in patients with 5-fluorouracil-based treatment for metastatic colorectal cancer: results of a multivariate analysis of 3825 patients. Ann. Oncol. 13, 308–317 (2002). Folprecht, G. et al. Tumour response and secondary resectability of colorectal liver metastases following neoadjuvant chemotherapy with cetuximab: the CELIM randomised phase 2 trial. Lancet Oncol. 11, 38–47 (2010). Sobrero, A. et al. Impact of sequence of biologic therapies on overall survival (OS) in patients with RAS wild-type (WT) metastatic colorectal carcinoma (mCRC): an exploratory, retrospective pooled analysis (abstract P-149). Ann. Oncol. 27, ii44 (2016). Zaniboni, A. & Formica, V. The Best. First. Anti-EGFR before anti-VEGF, in the first-line treatment of RAS wild-type metastatic colorectal cancer: from bench to bedside. Cancer Chemother. Pharmacol. 78, 233–244 (2016). Folprecht, G. et al. Survival of patients with initially unresectable colorectal liver metastases treated with FOLFOX/cetuximab or FOLFIRI/cetuximab in a multidisciplinary concept (CELIM study). Ann. Oncol. 25, 1018–1025 (2014). Misale, S. et al. Emergence of KRAS mutations and acquired resistance to anti-EGFR therapy in colorectal cancer. Nature 486, 532–536 (2012). Siravegna, G. et al. Monitoring clonal evolution and resistance to EGFR blockade in the blood of metastatic colorectal cancer patients. Nat. Med. 21, 795–801 (2015). Santini, D. et al. Cetuximab rechallenge in metastatic colorectal cancer patients: how to come away from acquired resistance? Ann. Oncol. 23, 2313–2318 (2012). Ciardiello, F. et al. Cetuximab continuation after first progression in metastatic colorectal cancer (CAPRI-GOIM): a randomized phase II trial of FOLFOX plus cetuximab versus FOLFOX. Ann. Oncol. 27, 1055–1061 (2016). Tonini, G., Imperatori, M., Vincenzi, B., Frezza, A. M. & Santini, D. Rechallenge therapy and treatment holiday: different strategies in management of metastatic colorectal cancer. J. Exp. Clin. Cancer Res. 32, 92 (2013). We thank all patients, their families and all investigators involved in the PRIME and PEAK studies. Medical writing support (including development of a draft outline and subsequent drafts in consultation with the authors, assembling tables and figures, collating author comments, copyediting, fact checking and referencing) was provided by Louisa Lyon, DPhil and Louise Niven, DPhil at Aspire Scientific (Bollington, UK), and funded by Amgen (Europe) GmbH (Zug, Switzerland). R.K. and P.B. were responsible for conception and design of the analyses. T.P. and J.-L.C. contributed to the design of the analyses. M.P., T.P., J.T., F.R., J.-L.C. and S.S. contributed to patient data collection. RK performed the data analyses. All authors contributed to the interpretation of the data, the preparation and revision of the manuscript, and approved the final version. M.P. has received research funding from Amgen, Roche and Sirtex, and honoraria from Amgen, Merck Serono, Roche, Sanofi Aventis, Servier and Sirtex. T.P. has acted on advisory boards for Amgen, Merck Serono and Roche, and has received travel support from Amgen. J.T. has acted in consultancy and/or advisory roles for, and received honoraria from Amgen, Baxalta, Celgene, Eli Lilly, Merck, Roche, Sanofi, Servier and Sirtex. Michael Geissler has received research funding and acted in consultancy/advisory roles for Amgen, Bayer, Merck, Roche and Sanofi. F.R. has received research funding from and/or acted on advisory boards for Amgen, Bayer, Celgene, Eli Lilly, Merck Serono, Merck Sharp & Dohme, Roche, Servier and Sanofi. J.-L.C. is a consultant/advisor for Amgen and Roche and has received institutional funding from Amgen, Novartis and Roche. G.P. has received research funding and advisory consulting fees from Amgen, Astra Zeneca, Boehringer, Bristol Myers Squibb, Lilly, Merck, MSD and Roche. R.K. is an employee of Amgen Ltd and owns restricted shares in Amgen. P.B. is an employee of Amgen (Europe) GmbH and owns shares in Amgen. S.S. is a member of advisory boards for Amgen, Bayer, Celgene, Eli Lilly, Ignyta, Merck, Merrimack, Novartis, Roche and Sanofi. All patients provided informed consent. The PRIME and PEAK studies were conducted in accordance with the Declaration of Helsinki. Study protocols were approved by an independent ethics committee at each study center. The PRIME (NCT00364013) and PEAK (NCT00819780) studies were supported by Amgen Inc.
Reageer op "Plaats van de primaire tumor bij uitgezaaide darmkanker geeft grote verschillen in overall overleving bij patiënten met RAS wild-type die eerstelijns behandeling met panitumumab krijgen"